I really love the colors, although there’s a certain retro feel to them. My living room has drab brown walls and even drabber grey carpet, so it does a lot to brighten up the room. 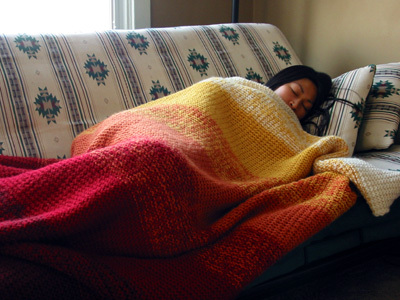 The finished blanket is quite a bit larger than I expected. I was aiming for a 4.5 feet by 5.5 feet blanket. What I wound up with is a blanket that’s 6.25 by 6.5 feet. Obviously I was still in my “gauge swatch, schmauge swatch” phase when I started this project. 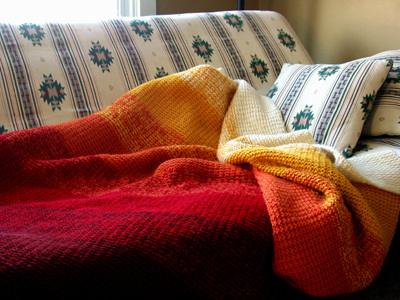 Normally I wouldn’t check gauge for a blanket anyways, but considering that the pattern calls for sport-weight yarn on US11s instead of worsted on US13s, it would have been a good idea. 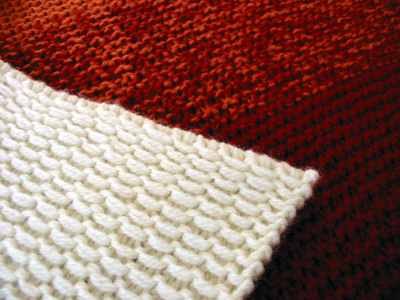 Here’s a closeup of the slip-stitch pattern, so you can see the contrast between front and back. If I were going to do this again (and no, I’m not going to do this again; I referred to it as my “knitting penance” for a reason) I’d choose a different yarn, maybe Plymouth Encore. I’m having horrible visions of accidentally felting this in the wash some day and winding up with a very pretty rug that took two years to knit. The Elann yarn also doesn’t wear that well. The bottom half, which has been dragged all over my apartment over the last two years, stood in sharp pilly contrast to the newly-knit top half. A careful go-over with a fabric shaver improved matters greatly, but I’m wary of how often I’ll have to do it to keep it looking nice. But yes. Between the cold (tonight’s low: 7 degrees) and the crazed, late-night studying for my neurobio exam this morning, and the fact that this thing took two years to knit, I’m going to accept its warm invitation. 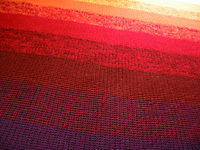 CogKnition posted this on February 9th, 2007 @ 5:11pm in Blankets, Finished Objects | Permalink to "Ombre Blanket"
ohhh.. that is so pretty. I like the colors that you used. I’m making one exactly like the one in the book, and I’ve been working on mine about a year and a half. I’m hoping to finish it one of these days! I liked the colors in the original pattern, but I think the ones you chose are even better! What is it about the pattern that makes it take so long to knit? Just the size? or is there something that further complicates things? Oh my God! I love it. Words cannot express how much I love that blanket. It’s mostly just the size. And in my case, I got bored with it and put it down to knit other things. It took a really, really cold winter to motivate me to work on it diligently enough to finish it! It’s gorgeous, like sunshine breaking through a cloudy day.